Fans get ready it's the announcement ya'll have all been waiting for!! 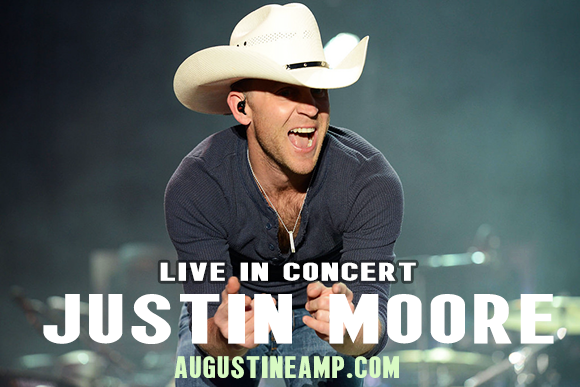 Justin Moore is coming LIVE to St Augustine Amphitheatre on Saturday 3rd March 2018! The incredible country star is getting his set together for another tour across North America and this time is going to be even bigger and better with a jaw dropping performance! Tickets are on sale right here, right NOW! Be sure to book yours fast as previous tours have proven – it's bound to be a sell out! "A ready-made image. He was that good kid from a small town with a rowdy heart of gold who just happened to be able to sing about it." The Country superstar, Justin Moore started his career in humble beginnings in his southern rock band with his Uncle. After graduating at High School he was able to make his dream come true, starting off in true artist style in Nashville, Tennessee! It was here that he met the producer, Jeremy Stover, who introduced him to Scott Borchetta, together they promised him the big break he was after, a record deal. On the Valory Music Group Justin Moore now has an impressive four studio albums, 2009, 2011, 2013 and 2016 releases! With his produced tracks, he has smashed the Hot Country charts, hitting the number 1 spot countless of times with "Small Town USA", "If Heaven Wasn't So Far Away", "Til My Last Day", "Lettin' the Night Roll", "You Look Like I Need a Drink", and "Somebody Else Will"; and the top 10 hits "Backwoods" and "Point at You". Grab the chance to catch all of these and more LIVE in the Spring! !